Dare starts her new series with a unique storyline, a sweet, fun nod to literary fandom, and two main characters who are perfect for each other yet never would have met if they weren’t each at a nadir in life’s journey. I think this is a truly unique historical that will appeal to readers who aren’t often historical fans. This book is already in my top books for 2014. This new series of Tessa Dare’s is off to an amazing start! Splendidly talented Dare creates cleverly written dialogue, exceptionally appealing characters, and an engaging plot that gives a wink toward Beauty and the Beast and a nod to fandom, all key components in this wickedly funny and soul-satisfyingly romantic novel, the perfect launch to Dare’s new Castles Ever After series. 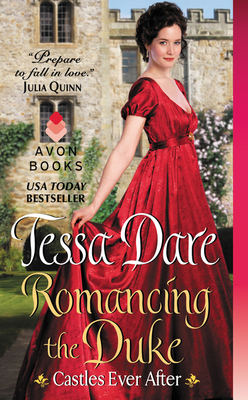 Tessa Dare’s first instalment in the new Castles Ever After series, ROMANCING THE DUKE will have readers clearing their keeper shelf just to make room for this little gem! Jam- packed with hilarious banter, Dare’s trademark humor is showcased in its full glory.